Starting here with the Auria Reverbs I will offer my thoughts on both the included, and the extra Auria FX & Plug Ins. I don’t have all of the Plug Ins yet, but I will eventually. That said there’s too many to write one huge review. Since I make ambient electronic music Reverb is a very important effect in my work. It’s an effect that has so many uses and is widely used by most musicians. 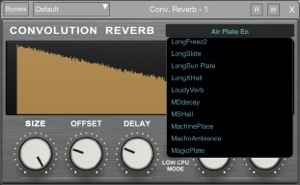 A seemingly common staple in any FX library, Reverb is anything but common. It’s like Reverb is an instrument itself. Most of the Reverbs found in iOS are very limited, and low quality. That’s understandable as it is a big power hog and our devices improving as they are, still struggle with processing even very basic low to medium quality Reverbs. 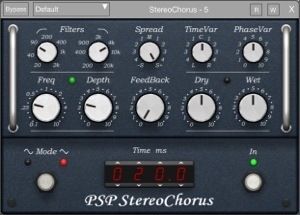 WaveMachine Labs with Auria and its PSP Plug Ins deliver much improved quality in the Reverbs offered rivaling ( still have a ways to go ) even some desktop versions costing tons more. I’ve tried nearly every available Reverb on iOS, including recent high profile releases like Cubasis. Incidentally having recently given Cubasis and its FX a test drive is still fresh in my mind, and its Reverb was sorely lacking. Whether old or new most iOS Reverbs left me unsatisfied. For now at least the highest quality Reverbs anywhere in iOS are living inside Auria. They are without peer. 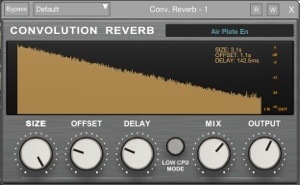 A better, basic Reverb option than most standard Reverbs in the vast majority of music apps. Simple controls for the overall effect much like what we’ve seen a lot of. It has a warmer feel with a decent tail and good stereo spread. Best used for recordings that just need a little more depth and life, nothing too dramatic. A good choice to conserve resources. This is probably the best reverb option on iOS that doesn’t cost extra. 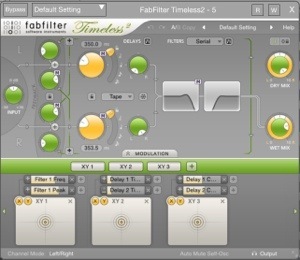 It uses high quality samples of specific types of reverberations called Impulse Response. The I.R. Library included has many very nice sounding reverbs that when used with your audio convolutes the mix. Hence the name. The “I.R. Library” installed is big enough, but you can also buy I.R library packs to further expand on your available options for an enormous (Hundreds and hundreds) variety of Reverb effects. The additional I.R. 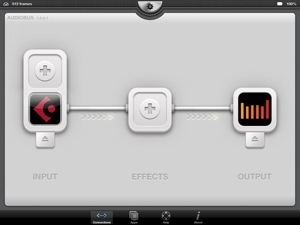 ( From MoReVox at $5.99 via IAP) packs each offer an expanded collection of specialized recording types to use. From short or long classic plates, warm, creamy, springs, and small rooms, to cold long hallways, Arctic, cathedrals, deep space, modulated, and tons more can be had. All high quality and original sounding. Rich and expansive. Each I.R. resembles presets for the most part somewhat making up for the limited controls. 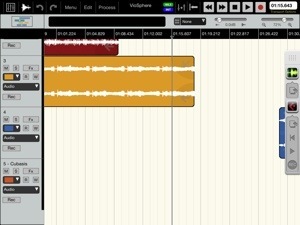 This is the reverb of choice surpassing anything else on iOS by leaps and bounds. Best used for your higher quality reverb needs to suit specific audio scenes. It should be expected that it comes at the expense of being a power hog. There is a “Low CPU” mode but that reduces the depth and quality a lot as well as reducing its burden on CPU. Freeze the track if you’re going to use it more than once as an insert. 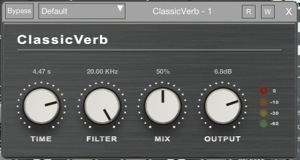 For $9.99 via IAP you can have a much better version of the included ClassicVerb. Is it worth it? I really think so. It adds more controls such as HiPass, LoPass, Split, Tone, Mix, Output, Spread, Time and Pre Delay providing an excellent level of control over your sound. 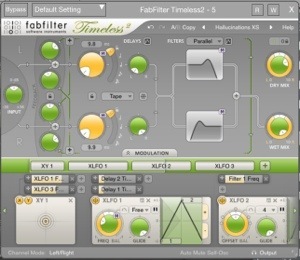 It has some quick presets and you can save your own tweaked concoctions. 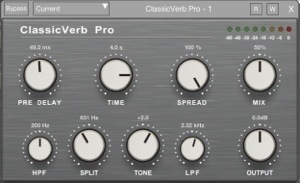 Overall it sounds better than the ClassicVerb but not as varied as the convolution reverb with its huge library of I.R. options. 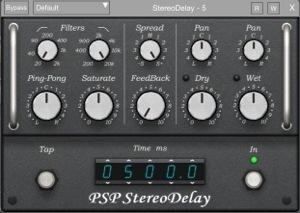 This is a great classic reverb option sounding much better than any other of its kind offered in any iOS music apps. A superb choice. Worth every penny. A unique resonant reverb effect that not only offers a high quality classic reverb spread, but also controls elements like tune, detune, modulation, and transposition of the reverberations. It has A&B alternate setting controls for “damp” and “Time” with “Freeze” for dramatic effects. Very different from the other reverb options, PianoVerb2 (a new improved and advanced version of the original free PianoVerb) uses 12 resonant filters that behave much like piano strings. Making ghostly wide, modulated sounds with lingering effect similar to piano sustain pedals is just one of its many possibilities. You could really go wild making highly unusual detuned and transposed reverberations that the others can’t. Whatever you do with this, it will fill your ears. This is one very nice, and interesting plug in! Not like a convolution or classic reverb, PV2 is quite capable of adding depth to relatively weak sounds but with that extra bite of resonance. It is really cool and different. You’re robbing the Auria store by only paying $9.99 for this weird reverb. Also a bit of a power hog. That concludes Part 1. Just a couple notes. The PSP PianoVerb2 in Auria is not the same as the older classic PianoVerb free version. It is a more advanced and improved version of the classic original. I know, thats obvious and clearly says “PianoVerb2” in the review but people don’t always pay attention details and are eager to correct. Comments welcome, and so are corrections, so long as they are actually correct. All of these were tested thoroughly. The best test for Reverb is to take a mediocre sounding, single note, dry recording. Then duplicated and spaced appropriately apart to fully experience the depth and quality. Then I added more recordings to other tracks trying each of these at various settings, I.R.s etc, solo and mixed. Each of these performed uniquely well. That’s how I tested them anyway. Try your own way, nothing beats experimenting yourself. I hope this might help or be of some use. Let me know and I’ll keep adding to the series. I suspect this will happen again. I mean having to add a newly released plug in for the various categories as this goes on. A welcomed challenge for sure. 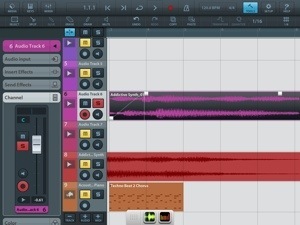 SpringVerb2 ($9.99 via IAP) arrives to expand on available Reverb options in Auria. 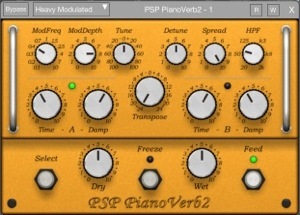 Like PianoVerb2, SpringVerb2 offers a unique and unusual reverberation effect. 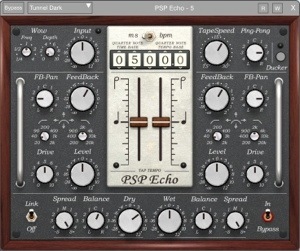 SpringVerb2 is an emulation of hardware spring reverbs. The sound it makes may be what you would expect, a springy, boingy, mechanical type. It can be used just as well as a pretty nice standard reverb, but its strength is in its odd boing sound that when coupled with fast attack instruments, synths, or especially guitars brings something very different to the Reverb table. A cool effect on transients, or repeatable with a superb spread range. Controls over the musical elements of the effect such as Diffusion, HiPassFilter, Presence and more put you in the pilot seat with plenty of room to experiment. See above screen shot for all the controls. Adjustable 2-4 springs variations, and a solid amount of controls to make soft, modest boings, to long mechanical springs reverberating in some alien spaceship machine shop. This one has its own character. Coming up soon Part 2- Delay/Chorus. A look at all the Delay/Echo and Chorus related FX. Special thank you to WaveMachine Labs granting me access to all these amazing tools. I am eternally grateful. Furthermore, and just as special, thank you to everyone for the private messages, posts, comments, tweets, etc, encouraging me to continue with this series. It may end up being an endless endeavor if they keep adding new things to Auria’s store. I can’t say I’d have any objections, keep ’em coming! Ill do my best to keep up.